I am lost inside my art. With every brush stroke, I am carried farther away from the troubles that inhabit my brain. I breath in the smell of the paint and see the whiteness of my canvas transform from something empty and dull into a world of color and delight. Painting quiets the noise in my head. that crawl through my head? when I am hardest to love? Okay, time for a little soul-searching. 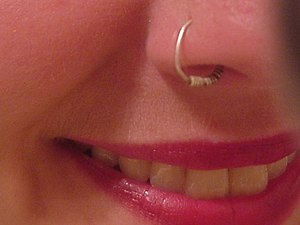 My daughter, J, told me she was going for coffee, then went out and got her nose pierced. What was my reaction? I was pissed. Let me explain. J, age 25, lives with me because she cannot live on her own. She cannot handle her money, her actions, etc. due to her bipolar, eating disorder, and other assorted problems. She’s tried, many times, but she just is not ready. Money is still an issue even though she lives with me. We’ve tried all different ways, from me holding her money to her getting an allowance, but money is an issue for both of us and it causes great conflict between us. So when she runs off and spends money she doesn’t really have, it pisses me off. It’s not the piercing. And before that, it wasn’t the tattoo(s). I have nothing against either one. I just get so damn angry when she does impulsive things, especially if it costs much money. She doesn’t think things through, she just does it. I am also tired of being that voice of reason for her. I can barely be the voice of reason in my own head, and it is draining to constantly do it for her. I resent it. I resent being the “Impulse Police”. I can normally let the little things, like piercings, roll off of me. After all, what’s a little hole in her nose compared to, say, taking 1/2 bottle of pills? But sometimes, I find it hard to turn off the “Impulse Police”. And when I do, sometimes the results can be devastating. Also, I think I am a little jealous. She is at an age where she can get away with doing a few impulsive, sometimes even reckless things. Me? I’m supposed to know better, so when I behave recklessly I just feel…stupid. I actually like tats and piercings. So why do I react like some 90 year-old stuck-in-the-past grandmother when she gets them done? I don’t like that side of me because it is not reflective of how I really feel about it. That is something I need to work on.